I usually try not to pay attention to the Kardashians, because they are a family full of well-known stunt queens. They have proved time and time again that they will do anything for a storyline and attention—whether that attention is positive or negative. Kim’s latest stunt is no exception, but it deserves to be addressed because this broad has got to be trolling black women, and I’m tired of it. Now, Kim. You know that Bo Derek did not originate that hairstyle. While she may have been the first white woman mainstream America saw wear the style, we all know that she got it from black American and African women throughout the Diaspora who have been wearing their hair like this for generations. This is a repeat lesson for you, Kim. We went through this with you before over the whole “boxer braids” thing, remember? You know what? People need to learn how to pay homage or not talk about a hairstyle at all. You and your sisters make it a habit to appropriate and accessorize blackness while simultaneously working overtime to erase the very black women you spend a fortune trying to emulate. It is especially egregious for you—a woman married to a black man and raising black children, including two daughters—to be practicing this kind of erasure. What lessons are you going to be passing on to your two black daughters? Are you going to be teaching them that it’s acceptable for their culture to be robbed and pillaged by culture vultures like you and your sisters without any acknowledgment? And let’s not forget that Bo Derek herself also tried to downplay the cultural appropriation inherent in white women wearing the style. In 2015, Derek came to the defense of Kylie Jenner, who was summarily dragged for wearing the style. That’s easy to say when you are a white woman being praised for wearing a hairstyle for which black women are denigrated. 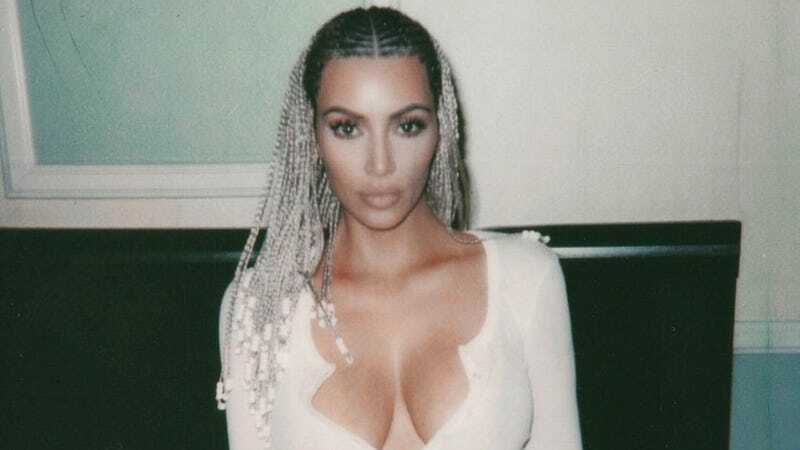 In 2018, there are still black women being told that their natural hairstyles are not appropriate for the workplace, but by all means, let’s act like Kim Kardashian is committing a revolutionary act by wearing cornrows. Kim ended up getting sufficiently dragged on Twitter, but there has to be a greater lesson for her here. At this point, it’s not so much about you wearing the hairstyle as it is about you trying to attribute it to someone other than a black woman.